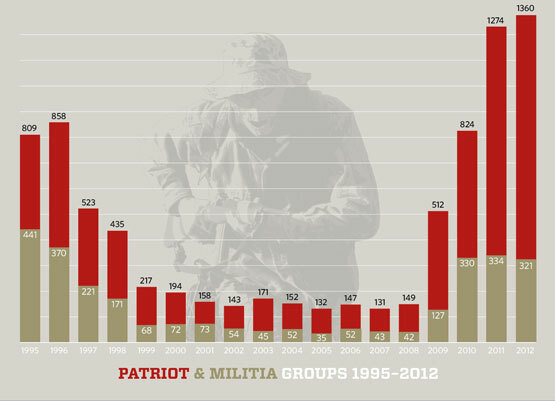 Chart showing the growth of militant “patriot” anti-government groups in the U.S. Forget Muslims. In 2013, America’s biggest terrorist threat is from “Patriot” groups, those radical militias and anti-government groups whose members think the federal government is conspiring to take away their guns, destroy their liberties and pave the way for a global “one-world government.” According to the Southern Poverty Law Center, the only group that tracks the growth and activities of American domestic hate groups and extremists, the re-election of President Obama coupled with the president’s pursuit of gun control legislation has led to explosive growth in the number of anti-government conspiracy groups, which in turn has dramatically increased threat of domestic terrorism. The number of right wing anti-government groups in the U.S. reached an all-time high in 2012, the fourth year of explosive growth in this increasingly militant sector of the U.S population. In 2012, the SPLC counted 1,360 so-called “Patriot” groups — an increase of 813 percent since just 2008. On March 5, 2013 the SPLC sent a letter to Department of Justice Attorney General Eric Holder and Homeland Security chief Janet Napolitano warning of the threat. The SPLC wrote a similar letter in 1994 to then-Attorney General Janet Reno warning of a growing threat of domestic extremism. Just six months later, Timothy McVeigh bombed the Oklahoma City federal building in the deadliest act of domestic terrorism in the nation’s history at that time. SPLC reports that over the last few years, law enforcement officials have discovered and thwarted numerous terrorist plots being formed within the militia subculture, including plans to spread poisonous ricin powder, attack federal installations and murder federal judges and other government officials. The same day it sent its letter to the DOJ and Department of Homeland Security, the SPLC issued its 2012 report on the anti-government movement. The SPLC’s website also has an interactive, state-by-state map of hate groups currently existing throughout the U.S., with their names, locations and the objects of their hatred. The SPLC are the real radicals. The only Govt. I’m against is a lawless one that undermines the Constitution. Stop deliberately misusing words- such as Patriots! Stop pretending that Patriots are Terrorists- we aren’t terrorists! Lunatics like the “FBI”, the “US Military”, “Border Patrollers”, etc., are the Anti-American Terrorists! The so-called “federal government” is not only Bankrupt, & Head- Over- Heels in Debt, It’s Operating Way In The Red, & It Has A Huge, & Increasing, Budget Deficit. There’s virtually zero $ for anything whatsoever. Leroy, you are missing the point. The term “patriot” is, in fact, misused by the so-called “Patriot” movement, which encourages seditious acts aimed at undermining the authority of the U.S. government. That is hardly patriotic. The SPLC defines the so-called “Patriot” movement this way: “Generally, Patriot groups define themselves as opposed to the ‘New World Order,’ engage in groundless conspiracy theorizing, or advocate or adhere to extreme antigovernment doctrines. Antigovernment groups do not necessarily advocate or engage in violence or other criminal activities, though some have. Many warn of impending government violence or the need to prepare for a coming revolution. Many antigovernment groups are not racist.” One thing is clear: so-called “patriot” and anti-government militia groups would not exist if it were it not for the high level of ignorance that pervades them. Such ignorance evidently has some political value, as little is being done by more level-headed leaders on the right to ameliorate it.